If you want to write a post displaying HTML tags, you cannot write them in the post editor as is direct. If you do, after publishing, those HTML tags will be interpreted as HTML codes and the HTML tags will not be displayed as is. To display HTML tags after publishing you will have to encode/convert them as explained at How to post special characters. Blogger which is owned by Google do not have direct support for users. This is also true for the majority of other Google's products. User support is provided via public forums using Google Groups where volunteer Google Top Contributors assisted by Google Employees help out. For Blogger, the public forum is at Blogger Help Forum. It would be wise to become member of this forum and if you have already joined, to stay a member. However, if you for your own personal reasons wants to leave, the way stop membership is not so simple or direct. To leave, you would first click on MY GROUPS at the Google Groups homepage. Have you registered your own domain and converted your blogspot blog to custom domain? If so, I highly advise you to record the original blogspot URL (address) in some place safe and easily retrievable. Reason: if ever your blog is wrongly identified as a spam blog or for TOS violation, the original blogspot URL will come in handy because you cannot use the custom domain URL to request for review. Do not assume that custom domain are immune to deletion? 3. type the codes for the characters where you want them. Note that it is possible to use these HTML codes to display special characters in post titles as proven by a test - Test displaying special characters in post title. The default of previous versions of Blogger is for every depression of the ENTER key to result in a line break in the post editor. This is good as it is instinctive to most people. 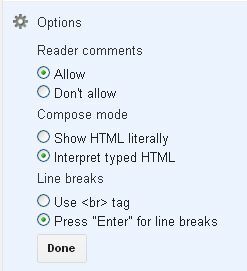 However, in the latest version of Blogger, Google has for its own reasons changed the default where you need to type the HTML line break tag <br> in order to make a line break. Many who just started with Blogger (and even the seasoned ones in the beginning) will blissfully unaware and compose a post just like using a type writer, ie, to press the ENTER key each time we wants a line break. The unaware after publishing a post find to their horror all the text jumbled up into one large paragraph.